Demodex mites are tiny little parasites that are a part of the human ecological community of microorganisms that live within or on the human body. Yup, you read that right, little microorganisms live on your body. You shouldn’t be too alarmed though, having these parasites on your body is fairly common. Even though there are some skin conditions that could be caused or made worse by these mites, they generally do not cause any symptoms. However if the infestation becomes too large, combined with a weak immune system, or an allergy these parasites can cause irritation. How do you treat Demodex mites naturally? There are about 65 known species of Demodex mites, and various animals are carriers for various species of Demodex mites. You generally will find these tiny mites living in, or near hair follicles of mammals. In this article, we will explain to you the type of Demodex mites that can be found on humans, as well as show you what you can use to kill Demodex mites naturally. Demodex Folliculorum – This particular species of Demodex mites live inside your hair follicles and are thin and long like a worm, with short legs. They are usually found in the hair follicles on your face, but you can also find them in the meibomian (tear) glands of your eyelids. They are not only limited to your face though, but you can also find them on other parts of your body such as chest, or buttocks and typically hang around areas where sebum production is high. These mites can only survive on your skin, and die if they are separated from their host. These mites feed on skin cells. Demodex Brevis – This is the other species of Demodex mites that can be found on humans. These particular species are usually found in the sebaceous glands of human hair follicles. In a similar way of how Demodex Folliculorum resides in your hair follicles, these reside in the sebaceous glands. Unlike the closely related folliculorum, these mites feed on sebum within the oil gland cells. Rosacea – This is an inflammatory skin condition that causes facial flushing, or a tendency to blush easier than most people. Researchers have found that the concentration of Demodex mites on individuals that suffer from rosacea are four times greater than in individuals who do not have the condition. Researchers also found that individuals who have the type of rosacea which affects the eyes called ocular rosacea typically have Demodex folliculorum within their meibomian (tear) glands. Blepharitis – This condition is the inflammation of the eyelids, and typically involves the part of your eyelid where your eyelashes grow out. 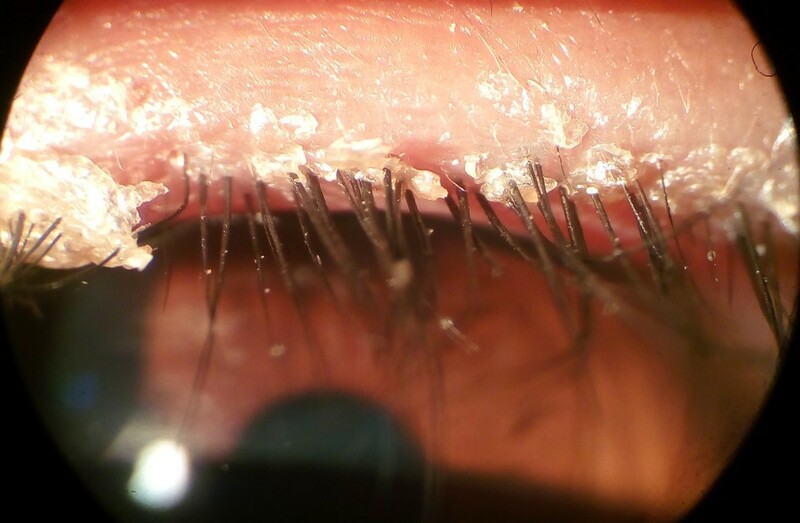 This condition typically is caused when the oil glands at the base of the eyelashes become clogged. Whenever that happens it can cause irritation, flaking of the skin around your eyes, crusty eyelashes, watery eyes, and much more. Researchers have found that Demodex folliculorum can cause anterior blepharitis with your eyelashes, and Demodex Brevis can cause posterior blepharitis with your meibomian glands. Androgenetic alopecia – This is commonly referred to as “male-pattern baldness” and can affect both men and women. Although Demodex mites do not directly cause Androgenetic alopecia, it is thought that a chemical that the mites produce could trigger an inflammatory reaction that could affect hair follicles and make the condition worse. Since these mites are microscopic. and you aren’t able to clearly see them with your naked eye, the only way for you to know for sure if you have Demodex mites is to have your doctor do a skin biopsy. They would take a small sample of your skin and look at it under a microscope to see if there are mites present on your face. Generally, you shouldn’t have to do much to treat Demodex mites unless they are causing symptoms or other complications. In small numbers, these mites may actually provide some benefit by removing any excess dead skin cells. If you were to have a large infestation of Demodex mites and need to treat them, there are a number of creams or medication that your doctor could prescribe. The issue with this is that these creams or medications can carry quite a price tag at times. If you were to look for a natural solution for treating Demodex mites, Tea Tree oil is very effective at killing Demodex mites at high concentrations. The issue with this is 100% Tea Tree Oil is very irritating to your eyes. Therefore many recommend wiping your eyelids with a diluted Tea Tree Oil solution, around 5%. This has been shown to be somewhat effective, but it can be better. Recently, researchers who were trying to determine which active ingredient in Tea Tree Oil that was responsible for the killing effect on Demodex mites found that out of the 15 known ingredients of Tea Tree Oil Terpinen-4-ol (4-Terpineol or T40) is the most effective at killing these mites. Researchers found that all the other ingredients were dose-dependent besides Terpinen-4-ol which was effective even at a concentration of 1%. This ingredient isn’t only found in Tea Tree Oil, however, and is the compound with the highest concentration in the essential oil of nutmeg, and occurs in Juniper trees. It is thought that this is the reason why the wood from this tree is highly resistant to rotting due to the antibacterial and antifungal effects of Terpinen-4-ol. This organic material fights off any parasites that may otherwise eat the plants. So how can you benefit from these great ingredients without the irritation of Tea Tree Oil? Cliradex is our #1 recommended product to help with Demodex mites that is a natural and preservative-free product that contains the active ingredient 4-Terpineol from Tea Tree Oil without all the irritating effects of Tea Tree Oil. Even though you can never truly completely remove Demodex mites from your face, the main objective with using a facial cleanser such as Cliradex is to manage the amount of Demodex mites that are on your face to reduce the irritation that they may be causing. Bio-Tissue the makers of Cliradex manufactures two products, a towelette as well as a lighter foam cleanser. Cliradex Towelettes – These facial wipes are convenient and fairly easy to use, and each one comes individually packaged. Before you use the towelettes, you would make sure that you wash and clean your hands and face before opening the packet. After you open the towelette from the package you would unfold the towelette, close your eyes without squinting and gently clean your eyelid area, as well as the surrounding facial areas. Do not get any of the formulae directly inside of your eye. Turn over the towelette and repeat for the other eye and allow for it to air dry. See the video below from Cliradex on how to use the eyelid wipes. Foam Cleanser – Cliradex Light foam cleanser is a modified version of the same Cliradex formula that you can find in the towelettes but a lighter formula that is great for using to control and prevent any future infestations of Demodex mites. Before using the foam cleanser you would also want to make sure that you wash and clean your hands and face beforehand. Afterward, you would dispense a dime-sized amount of Cliradex Light onto your fingertips and rub your hands together until the foam turns into a light liquid, close your eyes tightly without squinting and rub the formula into your eyelids and surrounding facial areas until it is fully absorbed. Check the video below to see how to use the foam cleanser. If you are looking for a natural, vegan and gluten-free way to take care of Demodex mites, and get relief from the symptoms from Demodex, rosacea, blepharitis, dry eyes or eye irritation Cliradex is your science-validated product that is proven to help alleviate those conditions. If you are interested in giving Cliradex a try, head over here to find out where to get Cliradex, and what the latest promo codes are to save you money on them. Have you tried Cliradex before? We would love to hear about your experience, let us know below! If you have any questions or comments, feel free to leave them below and we will get back you to as soon as we can. Very interesting article about mites, I never knew these things. Maybe this is what I’m suffering from, I have eye irritation for a long while now, never knew what it could be. Now reading about Mites, I will check it out if I have it. If so, your post really came on the right time! Hi there Emmanuel, if you think you might have them I would definitely visit your doctors office to get an biopsy done to be sure. Thanks for stopping by! I’m glad to say we, me and my family don’t have any symptoms of reaction to these mites. I’ve heard of the tiny animals populating our bodies. We live quite in the wild and have a lot od animals around us. I might have to get some packs of cliradex, just for being prepared. One dog here has a skin irritation for some years now, do you think I could try the tea tree oil on him? I hink it could be caused by mites. 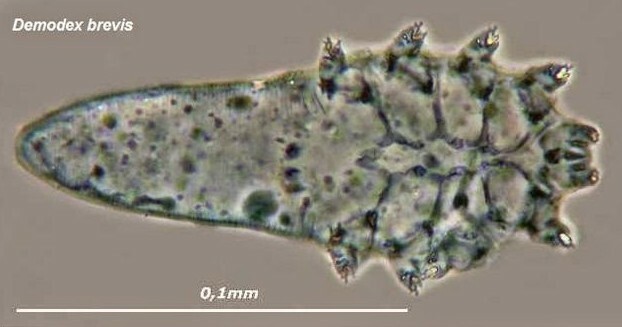 Hi there Stefan, there is indeed a species of demodex mites that specifically are only on canine. Have you tried any of the shampoos that have Tea Tree oil in them? Wow! Thank you so much for this post! I have been learning a lot about parasites for the past year and a half or so AND I have wanting to do more to heal my short-sightedness and anything related to my eyes. This is the first time I have read about demodex mites although I was diagnosed with blepharitis many years ago by my eye-doctor. And I do blush easily… so I am going to look further into this. I did notice that using coconut oil on my face helps reduce the redness… but any amount of essential oil on my eyelid, even accidental, usually get them to bloat… maybe a consequence of too many of these mites dying at the same time? I would also be VERY interested in reading your thoughts on what foods these mites don’t like? Garlic? Turmeric? Do you know? Hi Nathalie, I have personally myself used both the Cliradex towelettes as well as the Foam cleanser, and I personally did like the towelette, but the formula on the towelette is stronger and might be too much for some people. I liked the foam cleanser much better, it didn’t feel so as strong on your face and felt refreshing and not almost burning like the towelette. My eye doctor had recommended it for me to use to help alleviate my dry eyes and not for mites but, I can say it has helped improve how my eyes feel through out the day. I spend a lot of time looking at computer monitors which strain your eyes. And as far as I know there isn’t anything that you can eat that will bother these mites.